Bloodstone is legendary for its mystical, magical and medicinal properties. Sacred to Christians, who believe the dark red drops in this green jasper represent the blood of Christ, Bloodstone Genuine comes from our line of superb PrimaTek® naturally pigmented watercolours. 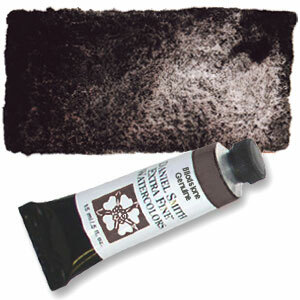 The intense and velvety aubergine mass tone of Bloodstone Genuine develops into a warm gray wash that lifts beautifully and provides immediate gratification when it comes to granulation, be it on hot- or cold-pressed paper. Bloodstone Genuine mixes very well with all of our watercolours and is especially wonderful with transparent Rhodenite Genuine and Quinacridone Burnt Orange. Click the button below to add the Bloodstone Genuine Series 2, 15ml Tube Daniel Smith Extra Fine Watercolour to your wish list.